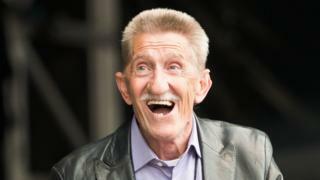 The funeral of Barry Chuckle, one half of the comedy duo the Chuckle Brothers, is due to be held in Rotherham. The 73-year-old entertainer, whose real name was Barry Elliott, starred in ChuckleVision with his brother Paul on the BBC between 1987 and 2009. A service will be held at Rotherham United football club, of which Barry was an honorary life president. A statement from the Elliott family said: “As a family we would welcome fans to celebrate his life and pay their respects with us, outside of the New York Stadium. The star had been unwell towards the end of the new show’s filming. Summer work was cancelled while Barry rested at his doctor’s request, but not long after his health deteriorated. The duo – who performed for friends and family in their garden before becoming famous – started their careers as The Chuckles on ITV talent show Opportunity Knocks in 1967. They received a special award at the Children’s Baftas in 2008.